Home / Indoor Furniture and Misc / All other types of Indoor Furniture Woodworking Plans for Projects / Nightstand Woodworking Plan. 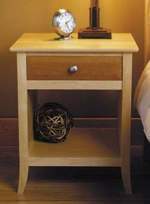 31-MD-00175 - Nightstand Woodworking Plan. Build a pair of these nightstands to go with your existing furniture, or pair them with the other pieces in the set for a complete look. Part of our maple and cherry bedroom suite, this Nightstand matches the Sleigh Bed (31-MD-00174), Armoire (31-MD-00171), Dresser (31-MD-00172) and Mirror (31-MD-00173). We used maple, maple plywood, cherry, and birch plywood, but you can use a wood of your choice. A full materials and supplies list is included with the plan. Bandsaw, jointer, drill press, table saw, planer, clamps, biscuit joiner, drill, router, hand tools.